We are engaged in manufacturing and exporting extreme quality Marble Rectangular Table Top that are manufactured using premium quality raw material. We offer these Office Marble Dining Table Tops in rectangular shape and attractive designs and colors. We export these Marble Pietra Dura Table Top in various parts of the country. 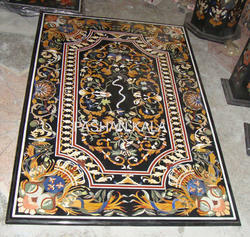 we have been able to provide fine quality of marble inlay table top. Size: 51" x inches | 60"
We are based in Agra(India) and ensure to make available the entire range of products to any required destination. Owing to our flawless transit system, we are capable of delivering the orders within the promised time frame. Our reputation in the market is largely attributable for manufacturing and supplying Stone Table Top. - Used as an interior decorative item. 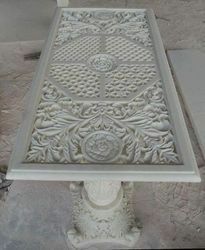 We provide an exquisite range of carved marble inlay table tops that possess the ultimate potential to adorn any decor.